You are browsing the archive for President Lyndon Johnson. Carl Dewey Perkins served the people of eastern Kentucky as their 7th Congressional District U.S Congressman from 1949 until his death on August 3, 1984 and during those 36 years the Knott County Democrat became one of the most powerful voices in Congress. 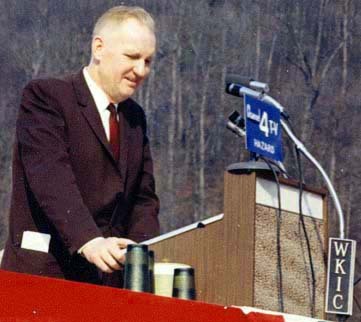 Born in Hindman, Kentucky on October 15, 1912, Perkins attended local schools and later would go on to earn his law degree and hold several local and state political offices, but it was his time in Washington D.C and his service to the people of his native eastern Kentucky and Appalachia that he will be forever best known for. Described as a ‘iron horse” for the people of Appalachia it did not take Perkins long to gain national recognition. After taking office as Kentucky’s 7th District Congressman on January 3, 1949, Perkins became an early supporter of civil rights by backing President Harry Truman’s attempt to establish a permanent Fair Employment Practices Commission (FPEC) in 1950. A permanent FEPC called for anti-lynching legislation and the abolishment of the Poll Tax among others. The bill was passed by the U.S House but the U.S Senate’s Southern Democrats “filibustered” the bill and it failed in the U.S Senate. Over the next decade Perkins continued to support the call for civil rights in America and he was one of only eleven Southern Democrats to support and vote for the Civil Rights Act of 1964. Also in 1964 Congressman Perkins became a central part of the Lyndon Johnson Administration’s War on Poverty in the U.S Congress. One of those bills was the creation of the U.S Job Corps under the Economic Opportunity Act, the Job Corps provides a free education and training program that helps the youth of America learn a career, earn their high school diploma/ GED, and find a good paying job once completed. Since 1964, Job Corps has served over 2 million young people and currently serves around 60,000 youths throughout the U.S each year. Perkins’ legacy while in Washington would have to be his relentless work for the under-privileged in America, especially eastern Kentucky and Appalachia. He became chairman of the U.S House’s Committee on Education and Labor in 1967 and held that position until his death in 1984. During that time he sponsored and backed many of the modern public schools federal legislation like the free school lunch program and vocational education which is currently known as the Carl D. Perkins Career and Technical Education Improvement Act of 2006. The federal student loan program or better known as the Perkins Loan also honors his name and has given the opportunity for thousands of Americans to attend college in the U.S. Also Perkins was seen as a strong advocate of the Head Start program in America. Another lasting legacy that Perkins created was perhaps felt most by the people he served for those 36 in Congress and that was he never forgot where he came from or who he worked for. He made frequent trips from Washington to the area and knew many of his constitutes by their first name. He stood up for his mountain people and the oppressed in America and never quit until he was satisfied that everyone was getting a fair shake no matter their economic status or background. Congressman Perkins has been decreased for nearly 30 years now, but the impact he made in America, especially in Appalachia will live on for generations to come. Carl D. Perkins’ personal and political papers are stored in the Archives section of the library at Eastern Kentucky University in Richmond, KY.